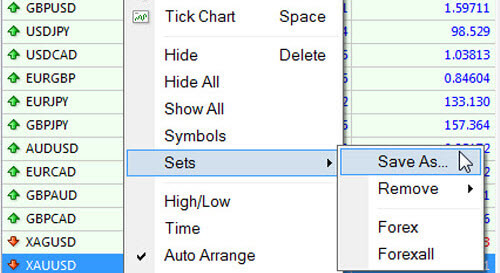 Have you ever needed to create a custom currency symbol set in your Metatrader 4 (MT4) Market Watch list? This can come in very handy if you only trade a few currencies (which is recommended, so that you can specialize in those markets). In this article, I’m going to show you, step-by-step, how to create your own custom Market Watch currency set/list. 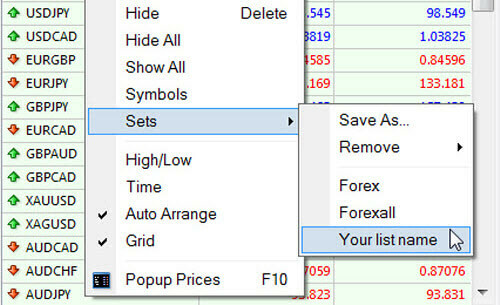 The standard Market Watch list in Metatrader 4 usually includes most of the currencies and commodities that your broker allows you to trade. Instead of searching through the entire list to find the currencies that you prefer to trade, wouldn’t it be easier to simply remove the unwanted currencies and commodities from your Market Watch list? Maybe you trade certain currencies and/or commodities with one trading system, and you trade other currencies and/or commodities with another method. Having separate custom symbol sets to switch between could save you lots of time and confusion in the long-term, and make you a more efficient trader overall. Step 1: Simply right-click inside the Market Watch list somewhere, and select “Show All” (see the image above). This will reveal all the currencies that are hidden in the current symbol set/list that you are viewing. You may or may not need to perform this step. If all the currencies that you would prefer to add to your custom currency set are already showing, you can skip this step. Step 2: Now you will need to remove all of the currencies/commodities that you do not want to show up on your custom symbol list. 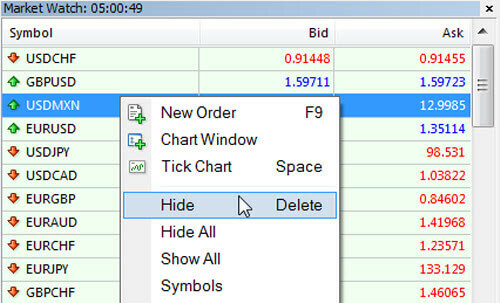 To do that you need to select a symbol and right-click (or simply right-click on the symbol that you want to remove) and select “Hide … Delete” from the menu (see the image above). Note: You must repeat this step until you have removed all of the unwanted symbols from your list, and you are left with just the symbols that you want to include in your custom symbol set. Step 3: Now you can save your custom currency list for future use. Simply right-click inside the Market Watch once again, scroll down to “Sets,” and select “Save As…” (see the image above). Name your list, and you’re done! Now You Can Load Your Custom Currency Set! Now you can access your custom currency list anytime you need it. Simply right-click inside the Market Watch window, scroll down to “Sets,” and select the name of one of the custom symbol sets that you’ve created. Metatrader 4 is not the best Forex trading platform on the market, but it’s free. It’s also the most used trading platform by Forex traders. Nothing else even comes close. MT4 has its limitations, but it’s backed up by a massive community of creative traders and programmers, which is why many traders, including myself, still use this free platform. 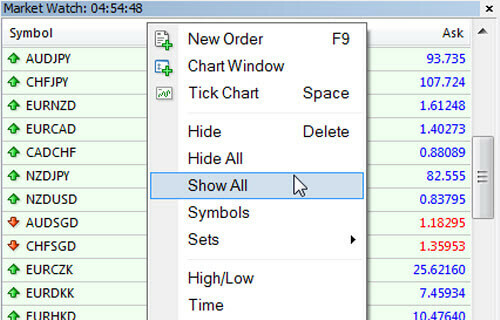 Now you know how to create a custom Market Watch currency symbol set in Metatrader 4 (MT4). I hope you found this short article useful. Come back soon to learn more ways to customize MT4, and be sure to check out my free price action course. Good luck, and happy trading! Looking for a profitable trading system? See why I switched to Day Trading Forex Live. Thanks very much! This has cleared 90% of my list, so I only have to see the pairs I need. Pleasekeep up the excellent tips! Hey there! Thanks for the comment. I’m glad you found this information useful. I have been researching this and I am really grateful for your information. Thanks for the comment, Randy. I’m glad this helped you. how to change the background color of mt4 market watch ? You can’t do that as far as I know. Some brokers are slightly different, but I don’t think the user can change the background.